An obvious source of vertices for The Graph is card transactions. The obvious alternative is to pay cash. But sometimes you actually end up in situations where you can't pay cash. I'm trying out using pre-paid visa/mastercard gift cards in those situations. They act like a real card. You can load them up to $500 dollars before they become a "financial instrument" and suddenly everyone wants to know who you are and where you live. Malls like to sell these as "universal gift cards" and you can also pick them up at just about any large-ish drug/convenience/grocery store. There's even a machine in the San Diego airport that will issue you one for a flat $5 transaction fee. 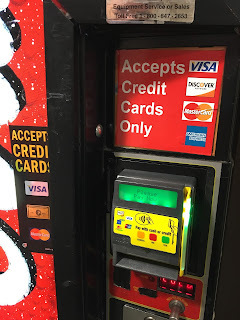 Fun fact -- the sketchier hotels I've stayed in seem to be switching over to vending machines that only take cards. Who wants cash sitting around waiting for someone to try to break in? The idea of using a card for a buck twenty-five purchase is a little odd to me though, considering the cut the processor takes. And I've been on gigs where the company break-room has an "open canteen" that's a bunch of stuff on shelves and a machine to handle the payment part. You scan your things, then swipe your card, and it charges you for the stuff. They do not take cash. So far, it's been hit-or-miss with these things. Merchants (or machines) can actually just refuse to take them -- I assume they can tell from the issuer id. And if you don't want to register your card on the issuer's web site, you're going to have trouble providing the billing zip code when a site or gas pump asks for it. But they do seem to work in the necessity situations like vending machines and buying drinks on an airplane. It's fun seeing where they work and where they don't.